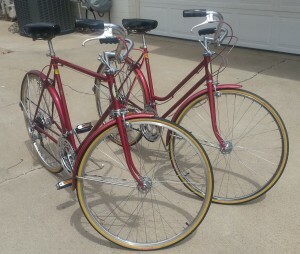 These are the 3 old Schwinn bikes that I have finished restoring. They are all from the early 70’s, and the two Burgundy Suburbans are the most original, restored with all NOS parts and period correct pieces. 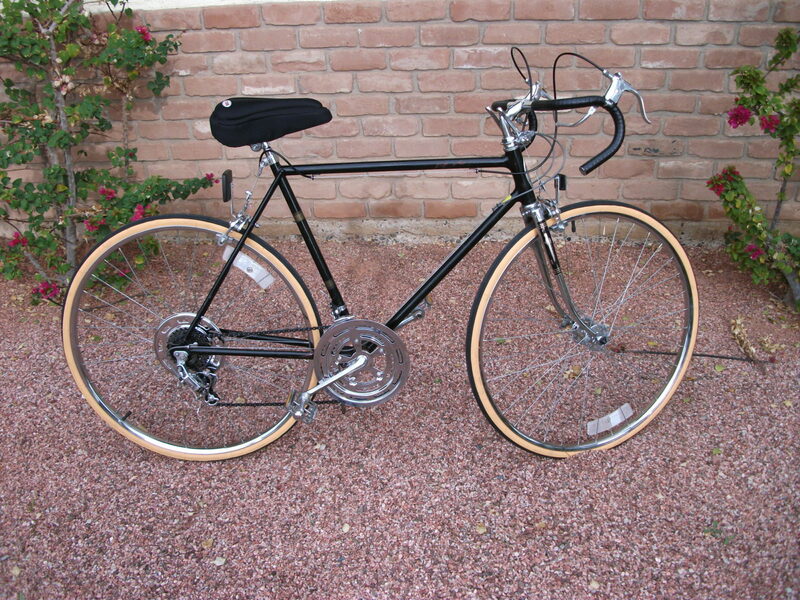 I originally assembled the men’s Suburban out of the box when I worked at the bike shop in 1971. The “root beer” Continental is a powder coated frame with new reproduction decals, but otherwise all original or NOS parts. Those classic water bottles on the front are actually from the late 50’s or early 60’s, so they are not actually period correct, but are apparently very rare. They are anodized aluminum, made by a company called Coloral, and I recently saw just the cork top from one offered on auction for $125! So, the bottles are worth WAY more than the bike. Whooda thought? 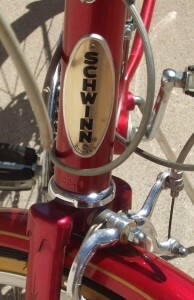 This great old Schwinn Collegiate from the late 80’s has seen many miles. 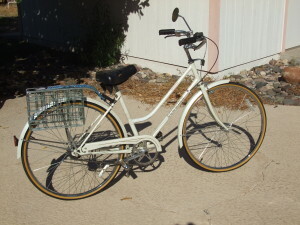 My mom used it as her primary transportation for years. I completely disassembled it and cleaned, polished, and re-lubricated every bearing and bushing including the internals of the classic Sturmey-Archer 3 speed coaster brake rear hub. It has new tires and pedals, and huge capacity folding baskets. The paint isn’t great, but it’s a classic solid old ride, and looks fabulous all cleaned up and tuned. This pair of old Suburbans were built within a month of each other in February and March 1972, and I bought them to turn into refurbished “riders” instead of “collectors.” They are each 1 frame size larger than the ones above, making them a more comfortable fit for both of us. Both were in somewhat rough shape when I got them, with as of yet unresolved paint issues, and some substantial fender scrapes and dents. I smoothed out the dents with careful kneading, and did a complete teardown and refurbish on both of them. The men’s bike has really bad rims on it, so I replaced them straight across with polished alloy Sun CR-18 27″ 36h SV Rim , 630 ISO (36 hole, Schrader Valve) which have proven to be a very nice ride. 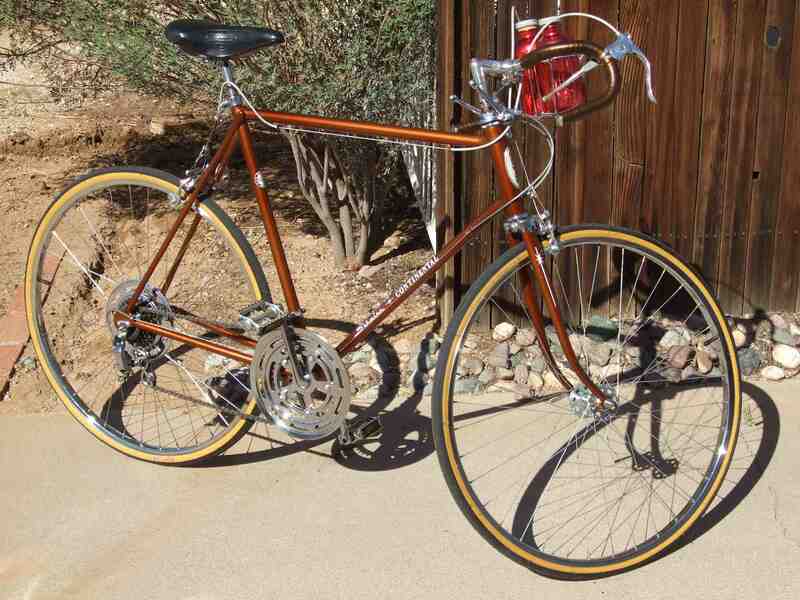 Nice thing is that those rims use the exact same spoke lengths as the original Schwinn rims, so it’s an easy swap. The ladies’ frame had very little use and just needed a lot of cleaning and polishing, although it was obviously stored with little regard, as it has the most cosmetic damage. 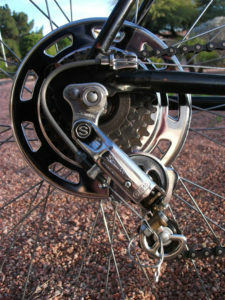 I replaced all the cables on both bikes, but opted for stainless steel core brake cables riding in Teflon® lined housings. I used stock on hand which accounts for the odd colors of the cable casings, and although they are not original, they give awesome brake feel when combined with the Dia-Comp Grey Matter brake pads. 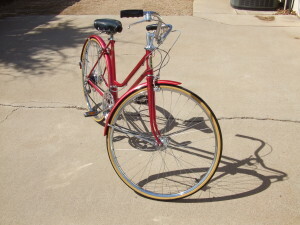 You do have to shave the pads a little to approximate the odd angle of the braking surfaces on the original Schwinn S-6 rims, but they are a perfect fit on the Sun Alloys. Both bikes ride like new, and bring back a huge wave of nostalgia with every turn of the pedals. As a matched set, they also turn a few heads as we fly by! UPDATE: A friend of mine dropped this 1979 Continental II by to have me look at it. Unfortunately, I do not have any “before” pictures, but it had been in storage for many years and developed a lot of surface rust and corrosion. He asked if I could pretty it up and make it rideable again, and so I took it on. I asked if he wanted it “restored” back to factory, or just “refurbished” to new condition, and he was emphatic that he wanted it reliable and rideable, not as a collector. steel pieces instead of the original alloy parts. The seat, too, was replaced once, and has a gel cover for comfort, and the brake pads are new technology Dia-Compe gray, for safety. 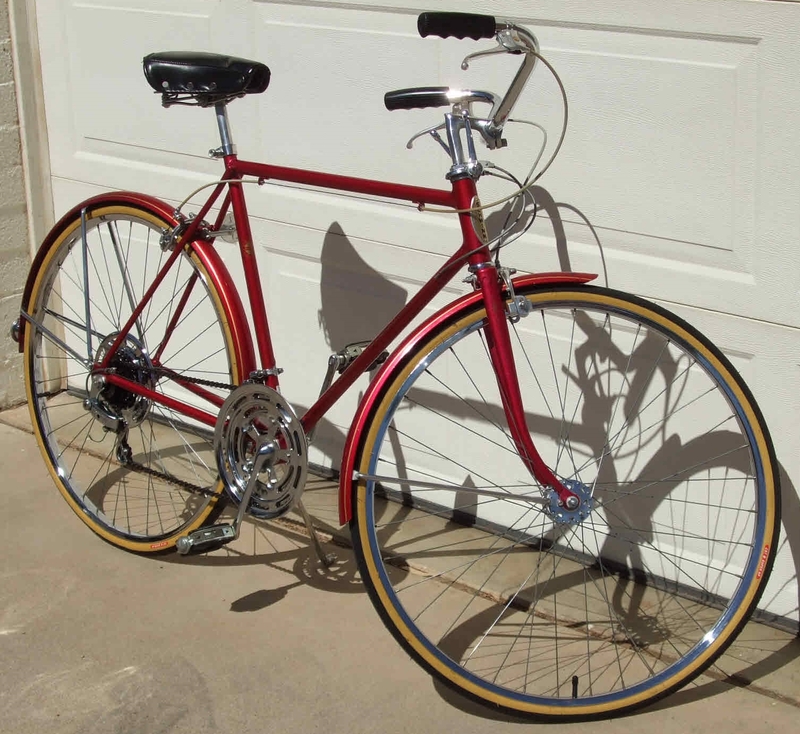 Of course, modern technology Kevlar tires and puncture resistant tubes are mounted on the original wheels hubs and spokes, which took many hours to bring back to life. 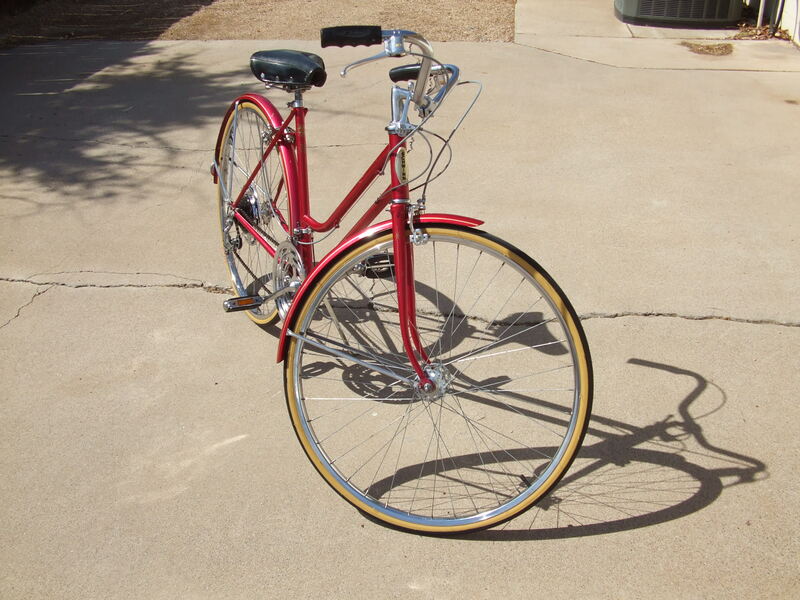 I replaced the small diameter spoke protector on the rear wheel with an earlier Schwinn design large one, because I just think it gives the bike a better visual balance and looks better. 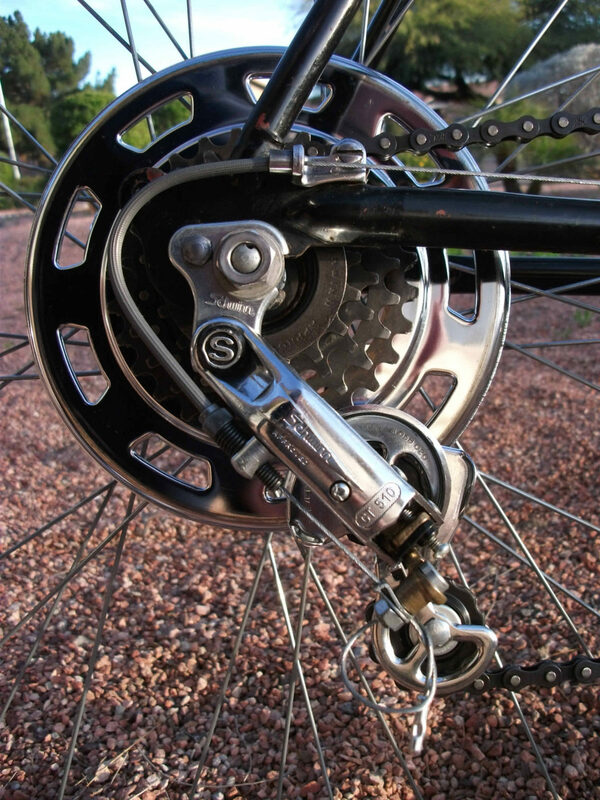 The original chromed forks, the crankset and chainwheels, and the front derailleur are original too, but the chain and rear derailleur were in pieces when I got the bike and not saveable. So, it is fitted with a new Schwinn chain and an original design, but replacement, rear derailleur. The 5 speed cassette was seized upon arrival, but 2 weeks in Stoddard solvent and lots of wire brushing restored it in both appearance and function. All of the brake components, likewise needed complete restoration and hours of polishing and buffing, but all were mechanically sound and are all original to the bike. 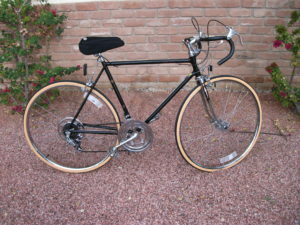 Again, for safety, new black Jagwire nylon lined brake cables were installed, but all of the gear cables and casings were replaced with NOS Schwinn parts. The ribbed derailleur cable casing is getting really hard to find anymore, but luckily I had enough still in stock from when I purchased it for previous rebuilds. Using old Schwinn catalog pictures as a guide, I realized that the safety reflectors on the bike when I received it were period incorrect, but I found and installed a complete set of originals, as they would have come from the factory. 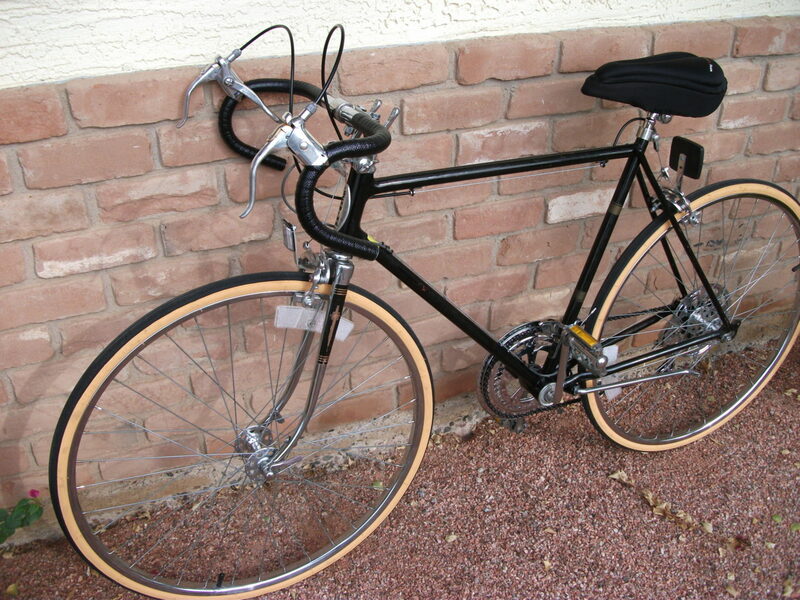 Lastly, I finished it off with two rolls of original period Schwinn NOS black handlebar tape, which put the finishing touch on a nice completely refurbished classic.